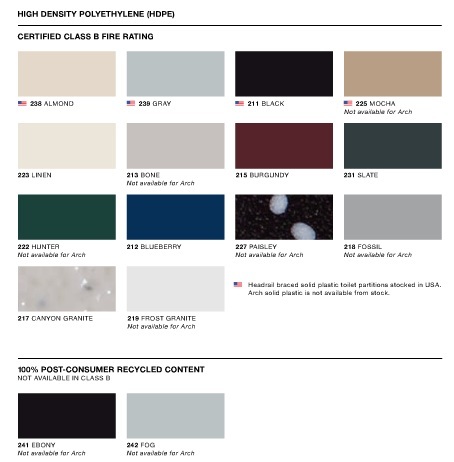 Hadrian Partitions - Partitions Plus Inc.
Hadrian offers a wide variety of colors and style, but sometimes it’s not all about the beauty, it’s about the quality. You can be sure that Hadrian partitions will last and will fit your every need. They offer both plastic and metal partitions to better fit your needs. 55” (1397mm) high doors and panels, mounted 14″ (356mm) off the floor. 1” (25mm) thick polypropylene (HDPP) or polyethylene (HDPE) material. Most graffiti can be cleaned without leaving a “ghost” behind. Available in headrail braced, ceiling hung and floor-to-ceiling configurations. Optional 16-gauge continuous hinge (available for all configurations) or Integral hinge (headrail braced only). Fasteners are theft-proof 6-lobe security head stainless steel screws. With 1″ (25mm) thick doors, panels and pilasters, Hadrian’s standard solid plastic toilet partitions offer the utmost in strength and durability. Gently curved doors and panels. 59” (1498mm) high doors and panels. Available in polypropylene (HDPP) or polyethylene (HDPE) solid plastic. Doors and panels are 3/4″ (19mm) thick while pilasters are 1″ (25mm) thick. Most graffiti can be removed without leaving a “ghost” behind. Available in headrail braced style only. Through the union of design elegance and rugged durability, Hadrian has developed the Arch series of solid plastic toilet partitions. Featuring distinctive hardware and gently curved doors and panels, the Arch takes design flexibility to a new plateau. 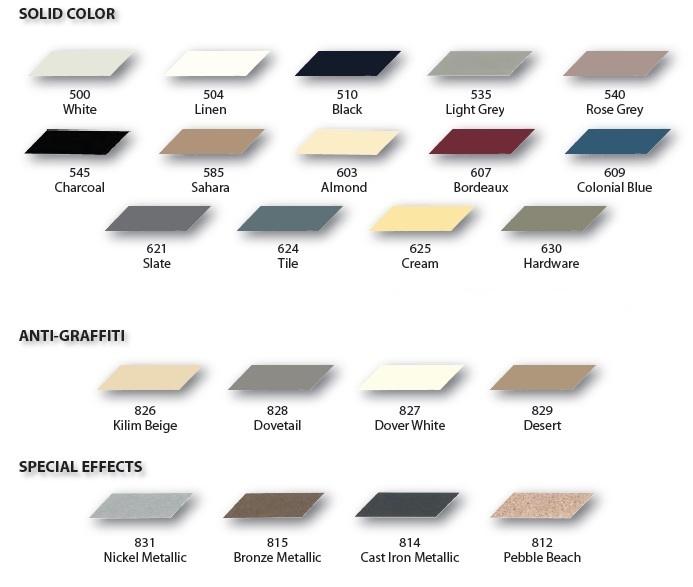 Hadrian’s superior powder coating system provides a uniform, durable and attractive finish that resists impact, abarsions chemicals and acids. 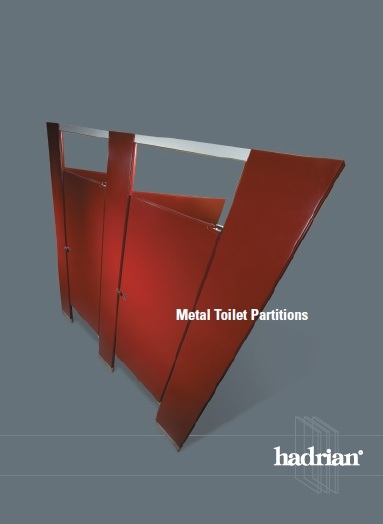 Featuring 58″ (1473mm) high doors and panels, Hadrian’s powder coated metal toilet partitions are available in a wide range of designer finishes. With 58″(1473mm) high doors and panels, Hadrian’s stainless steel toilet partitions offer long lasting beauty, a gleaming modern apperance, and easy to clean maintenance. Hadrian’s Elite powder coated metal toilet partitions feature all the advantages of standard partitions but with increased strength and privacy. Hadrian’s Elite stainless steel toilet partitions offer all the advantages of our standard stainless steel product, but with increased strength and privacy. The unique design of Hadrian’s Elite Plus powder coated metal toilet partition system offers the utmost in privacy. The unique design of Hadrian’s Elite Plus stainless steel toilet partition system offers the utmost in privacy.